One question I often get from fellow bathing beauty collectors is where to buy new wigs to replace their treasured bathers' missing tresses. 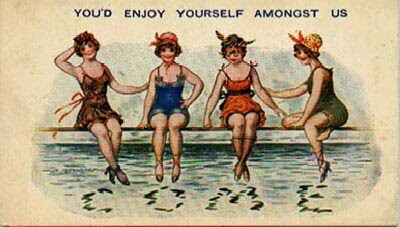 Although these bisque belles look charming without their bathing suits, they do look rather odd with bald pates. 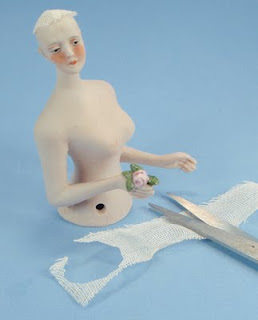 I have never found a source for suitable tiny wigs, and over the years learned to make my own, using the original mohair wigs from some of my Galluba and Hofmann bathers as models. So this month I explain my wig-making technique. 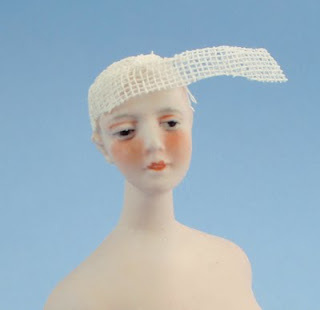 You will need self-adhesive bandage gauze to make the wig cap. I found my gauze in the first aid section of the local Walgreens. Suitable mohair is harder to find, but via eBay I have purchased a good quality imported English mohair that comes loosely woven around string. The mohair has a silky sheen, a nice soft wave, and comes in a variety of attractive colors. For this demonstration, I used blonde mohair and dark brown thread so that the steps would be easier to see. For your wig, you will want to a use thread that closely matches the color of the mohair, making the stitches all but invisible. The model is a beautiful half doll by Galluba. She is 3.5 inches high. Start the wig cap by cutting a small circle out of the gauze. Cut a slit in the circle from one edge to the center, then, overlapping the edges of the slit, form a skullcap fitting closely over the top of the pate. Using small strips of gauze, build up the rest of the wig cap. The cap should cover the top of the head, with the edges forming the hairline. Even out the edges of the cap with sharp scissors. 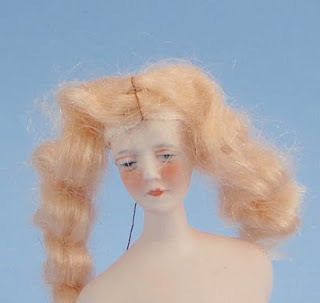 Unraveling a strand of mohair, place it across the front of the wig cap from ear to ear. You will want the strand long enough to form a ponytail that, when doubled over, will cover the back of the head. It is better to overestimate, because you can always trim off the extra. You can fluff up the mohair by gently tugging on the ends or carefully separating the strands a little bit. Don't overdo it, because you will end up with a frizzy mess. Blonde does not really suit this half doll; I usually select a color that best matches the eyebrows or complements the doll's complexion. Form a center part by, starting under the wig cap, stitching the mohair to the wig cap. Be careful handling the cap, because the gauze with adhere to itself. The stitched mohair should cover approximately the front half to third of the wig cap. Pull the two strands back (but not too tight), and tie them together at the nape of the neck, forming a double pony tail. Lock the two strand ends together by fitting the waves into each other. 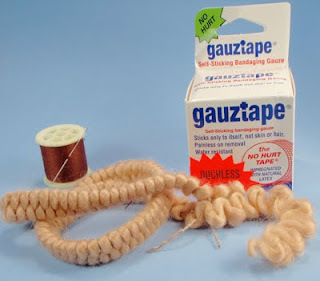 Very tightly and securely tie the ends of the strands together (you may want to wrap the thread around the ends several times before tying), trimming off the excess mohair close to this knot. 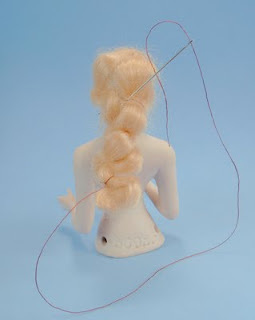 After tying the knot, leave one long strand of thread still attached. Thread this remaining strand of thread into a needle and pull the needle through the wig cap, just at the base of the pony tail. As you pull the needle through, the pony tail will fold double, bunching up to form a loose chignon. 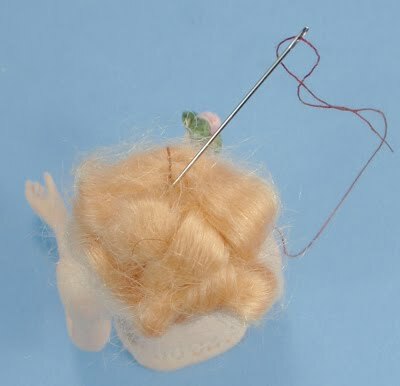 After pulling the thread tight, secure it with a couple of stitches under the wig cap at the nape and tie it off under the cap. Hold the folded pony tail against the cap, so that it covers the back of the head and meets the edge of the stitched mohair across the front. Coming up from under cap, the secure the folded edge to the end of the center part with a stitch. Still coming up from under the cap, use a couple of more stitches as needed to hold the folded mohair in place against the back of the head. 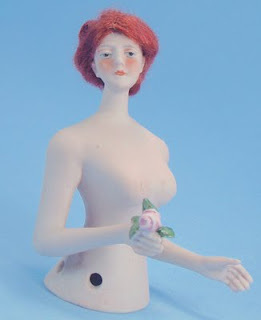 The appearance should be that of a coiled chignon. Using small, very sharp scissors, carefully trim away any fuzzy hairs sticking out (but be careful not to cut the wig itself). Using a needle or pin, carefully pull down the mohair strands around the face to shape and soften the hairline (but don't overdo it!). 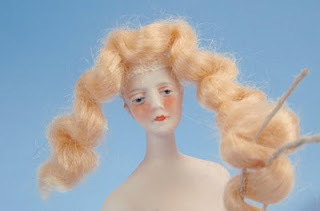 Here's our model in her new auburn mohair wig, made using this technique. 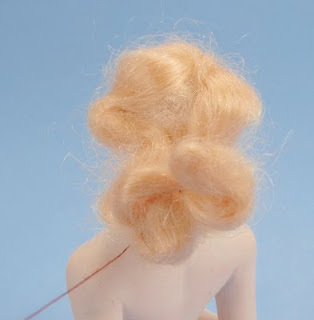 The back of the wig gives the appearance of a loosely coiled chignon, similar to the style found on many old Galluba.